Alongside printers from all walks of manufacturing, one can naturally expect to find people selling different kinds of filament at a 3D printing festival. One of these purveyors of plastic was Proto-pasta out of Vancouver, WA. Proto-pasta prides themselves on unique offerings and complete transparency about their manufacturing processes. Almost all of their filaments are either PLA or HTPLA with something special added during extrusion. The menu includes steel, iron, carbon, and finely ground coffee. The coffee filament was one of our favorites for sure. The print they brought with them looked solidified light roast and had a transparent kind of lollipop quality to it. I couldn’t detect the coffee scent due to allergies, but [Alex] assured me that printing with this filament will make your house or hackerspace smell terrific. [Alex] was giving away samples of their stainless steel composite PLA. This one can be polished to a smooth shine with a series of papers that run from 400 to 8,000-grit. Another of their newer offerings is PLA infused with magnetic iron particles. Prints made with this stuff can be rusted to achieve an antique, steampunk, or shabby chic aesthetic. Proto-pasta also has an electrically conductive composite carbon PLA. This one is great for capacitive applications like making a custom, ergonomic stylus or your own game controller. According to the site, the resistivity of printed parts is 30 ohms per centimeter as measured perpendicular to the layers, and 115 ohms along the layers. Have you made anything awesome with conductive or magnetic filament? Have you had any problems with unorthodox filaments? Let us know in the comments. A good multimeter (or a few of them) is an essential part of anyone’s electronics workbench. The only thing more useful than a multimeter is a logging multimeter that can take recordings over time. And the only thing more useful than that is one that can transfer that data back to your computer for analysis. But fancy meters often cost a bit of money. [Kerry Wong] decided to take matters into his own hands and hack a serial-out port into his relatively inexpensive multimeter, giving him the ability to record anything the meter can measure roughly three times a second until he runs out of hard-drive space. Our hack begins with the datasheet for the meter’s microprocessor. [Kerry] then tacked on a few wires, and dumped, modified, and reflashed the calibration and configuration EEPROM. With a single bit-flip in the EEPROM, he enabled serial output. With a few more, he made the backlight stay on longer, disabled auto power-off, and basically customized the meter the way he wanted it. Getting the data out of the meter is the big coup, however. Not wanting to risk the computer that he’s connecting to the meter, [Kerry] knew that he needed optoisolation between the meter and the USART. 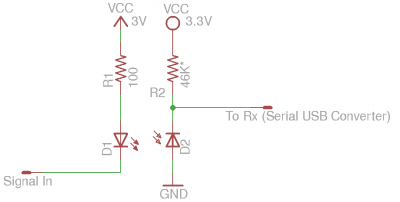 He went with a beautifully minimal solution — simply wiring the meter’s serial output to an IR LED. Usually, transmitting data over IR is done by modulating the signal with a 38 kHz carrier for noise immunity. [Kerry] was going to put the receiver right up against the transmitter anyway, so he went with a plain IR photodiode on the PC side. sigrok takes care of the datalogging and display. Ah laundry day. The washing machine, the dryer, the ironing, and the folding. No one is a fan of doing laundry, but we (I hope) are all fans of having clean clothing. Hackers, makers, and engineers are always looking for ways to make a tedious task a bit easier, and laundry definitely is one of those tedious tasks. This week we’re checking out some of the best laundry projects on Hackaday.io! We start with [Professor Fartsparkles] and Laundrify. Anyone who’s shared a washer and dryer with house or apartment mates will tell you how frustrating it can be. You bring your dirty laundry downstairs only to find the machines are in use. Wait too long, and someone has jumped in front of you. Laundrify fixes all that. Using a current sensor, Laundrify can tell if a machine is running. An ESP8266 monitors the current sensor and sends data up to the cloud – or in this case a Raspberry Pi. Users access this laundry as a service system by opening up a webpage on the Pi. The page includes icons showing the current status of each machine. If everything is in use, the users can join a queue to be notified when a machine is free. Next up is [Jose Ignacio Romero] with Borg Washing Machine. [Jose] came upon a washer that mechanically was perfect. Electrically was a different story. The biggest issue was the failing mechanical timer, which kept leaving him with soapy wet clothing. Washing machine timers boil down to mechanically timed multipole switches. They’re also expensive to replace. [Jose] did something better – he built an electronic controller to revitalize his washer. The processor is a PIC16F887. Most of the mains level switching is handled by relays. [Jose] programmed the new system using LDmicro, which is a ladder logic implementation for microcontrollers. For the uninitiated, ladder logic is a programming language often used on industrial Programmable Logic Controller (PLC) systems. The newly dubbed borg machine is now up and running better than ever. Next we have [Michiel Spithoven] with Hot fill washing machine. In North America, most washing machines connect to hot and cold water supplies. Hot water comes from the home’s water heater. This isn’t the case in The Netherlands, where machines are designed to use electricity to heat cold water. [Michiel] knew his home’s water heater was more efficient than the electric heater built into his machine. [Michiel] hacked his machine green by building an automated mixing manifold using two solenoid valves and a bit of copper pipe. The valves are controlled by a PIC microprocessor which monitors the temperature of the water entering the machine. The PIC modulates the valves to keep the water at just the right temperature for [Michiel’s] selected cycle. [Michiel] has been tracking the efficiency of the new system, and already has saved him €97! Finally we have [Mark Kuhlmann] with LaundrEsp. [Mark’s] washing machine has a nasty habit of going off-balance and shutting down. This leaves him with soggy clothing and lost time re-running the load. [Mark] wanted to fix the problem without directly modifying his machine, so he came up with LaundrEsp. When the machine is running normally, a “door locked” light is illuminated on the control panel. As soon as the washer shuts down – due to a normal cycle ending or a fault, the door unlocks and the light goes out. [Mark] taped a CdS light detecting resistor over the light and connected it to an ESP8266. A bit of programming with Thinger.io, and [Mark’s] machine now let’s him know when it needs attention. If you want to see more laundry projects check out our brand new laundry project list! If I missed your project, don’t take me to the cleaners! Drop me a message on Hackaday.io, and I’ll have your project washed, folded, and added to the list in a jiffy. That’s it for this week’s Hacklet. As always, see you next week. Same hack time, same hack channel, bringing you the best of Hackaday.io! Let’s face it: 3-dimensional odometry can be a computationally expensive problem often requiring expensive 3D cameras and optimized algorithms that can be difficult to wrap our head around. Nevertheless, researchers continue to push the bounds of visual odometry forward each year. This past year was no exception, as [Christian], [Matia], and [Davide] have tipped the scale in terms of speed with an algorithm that can track itself in 3D in real time. In the video (after the break), the landmarks are sparse, the motion to track is relentlessly jagged, but SVO, or Semi-Fast Visual Odometry [PDF warning], keeps tracking its precision with remarkable consistency, making use of “high frequency texture” as a reference. Several other implementations require two cameras or a depth camera variant, but not SVO. It uses a single camera with a high frame rate between 55 and 300 frames per second. Best of all, the trio at the University of Zürich have made their codebase open source and available as a package for ROS.